RUSH: Well, I guess congratulations are in order. President Obama, Al Sharpton, Attorney General Eric Holder, St. Louis is on fire again. Ferguson, Missouri, a couple of cops shot, protests, people still think that “hands up, don’t shoot” happened. The attorney general sends out this report: Ferguson police department racist. Ferguson police department filled with prejudice. What did they think was gonna happen? What in the world did they think was gonna happen? After all of those months of perpetuating what everybody knew was a lie, “hands up, don’t shoot,” they had to give the crowd something in the final report, and they did by pointing out the Ferguson police department’s racist. And the cop, the police chief resigned. 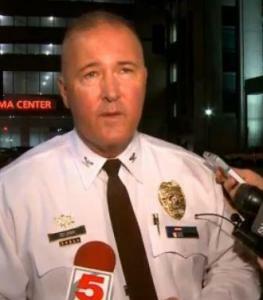 Do you know why the police chief resigned in Ferguson? It wasn’t over any of that. The Justice Department investigation found out that the police chief was working in concert with other town officials to raise money for the town by increasing traffic fine citations, which we all know or we all have suspected police departments do all over the place. They fill the monthly quota, stop people for speeding, be a little bit more vigilant on it. So the police chief resigns and we have the town on fire. George Soros is in town, our blowtorch affiliate in St. Louis, KMOX, has been saying all morning long that there are 30 different groups, if I have this right, being sponsored and paid for by George Soros in St. Louis who are conducting what are supposed to look like spontaneous protests, but they’re being bought and paid for. But what do you expect is gonna happen? Ever since this event happened we have been fighting back against it. The powers that be have been promulgating a lie. “Hands up, don’t shoot” happened, white cops shoot black kids all the time, and this is it, this is the last straw, we’re not gonna take it anymore. It doesn’t happen. It’s not regular. It’s not something that happens. It is not anywhere near a routine event. It was totally manufactured as such. I mean, the truth of this event in Ferguson has long been known, and it’s long been denied because it’s been used as a weapon to advance the civil rights agenda, leftist civil rights agenda. And the truth, of course, falls by the wayside, doesn’t matter. Even when it’s known, people who know the truth, the highest positions of leadership and therefore with the highest presumption of authority, respected authority, knowingly promulgating falsehoods. Now, what do they expect to happen after months and months and months of this. So the attorney general, Eric Holder, is out there saying it’s repugnant and they don’t agree with it. And we put together a little parody here of what might happen if Al Sharpton and the president got together in the aftermath of this event. RUSH: Of course that didn’t happen, and it won’t happen. But we can play the game, too, right here on the EIB Network. Great to have you with us, my friends. Rush Limbaugh, behind the Golden EIB Microphone at 800-282-2882, and the e-mail address, ElRushbo@eibnet.com. “Two officers were shot in front of the Ferguson Police Department early Thursday while demonstrators were gathered –” and again, supposedly 30 different groups bought and paid for by George Soros, who, of course, is interested in promoting the mainstream leftist agenda, which has at its heart a desire to tear apart the fabric, the very spine of this country, the very backbone, just shred it and tear it apart. And it’s what they’re doing. It’s what they’re attempting to do. I don’t know why anybody is surprised. You cannot lie to people for this long and not expect this kind of reaction. You know, it’s doubly sad, too, because now the impression is with people, because it’s been said in an official report from our own Department of Justice that the police department in Ferguson and, by extension, the police in America are just a bunch of racist pigs. And the work they do and the safety that they engender, the effort they make to make it possible for everybody to go about their business, for everybody’s business to stay open and not be looted gets overrun by another myth that the cops are just a bunch of racist pigs. BELMAR: This is really an ambush, is what it is. I mean, you know, you can’t see it coming. You don’t understand that it’s going to happen. You’re basically defenseless from the fact that it is happening to you at the time. And that is something that is very difficult to guard against when you have a group of officers standing in a large group and then, you know, you have gunfire, certainly gunfire directed at them. RUSH: And Belmar continued with this. BELMAR: I’m gonna be honest with you. This is beginning at times to be very difficult for any law enforcement agency anywhere, to really wrap their arms around. I want everybody here to understand how difficult this is to do it the exact perfect way. It’s very tough. RUSH: Cops are getting fed up with being targets. Enough of this. Where’s the condemnation? Well, we’ve got a little bit of a condemnation from the attorney general who’s retiring. He considered it, called it a repugnant affair, a repugnant attack and totally unwarranted and unjustified. Yet these are the people that knew “hands up, don’t shoot” didn’t happen. They knew it. This is the height of irresponsibility. They did nothing to stop it. They said, “Well, this is what the community thinks. We have to recognize and respect the community attitude. The community thinks this, the community feels this, and we must give them a wide berth and respect and understand their rage and anger.” Well, if it’s fueled by an untruth, why not tell ’em the truth? Why not tell them the truth? Why not tell them that “hands up, don’t shoot” didn’t happen? But even now they know it. The grand jury report is out. But, you see, we’ve had such highly respected authority figures — I mean, I’m gonna tell you, the Department of Justice, an African-American attorney general, the White House with an African-American president is gonna trump a local grand jury every day of the week in terms of respect and authority. The grand jury can release information, everybody knows what happened, but if the DOJ and the White House say something else, they’re gonna trump what a local grand jury says, just in terms of the respect that those places have, the departments, the White House and the Department of Justice. Worse that then, they didn’t do anything to stop the spread of these lies that have perpetuated these protests. You got George Soros and people paying for these protests to continue, and the cops become sitting ducks and targets. And then an entirely new narrative’s created about who the police are and what the police are, and the police become the enemy. The police become the problem, and nobody stands in the way to stop this. Nobody speaks up to correct it, not in official Washington. So the cops were smeared. After Darren Wilson was attacked, after Darren Wilson was forced to defend himself, and after Darren Wilson had been entirely exonerated, he continued to be smeared. The cops were smeared knowingly. See, there’s blame here that extends beyond these shooters. Those that perpetuate this “hands up, don’t shoot” lie need to explain why they are not part of the problem. And everybody knows now that “hands up, don’t shoot” didn’t happen, it never did happen, there was never any legitimate data to suggest it did. It was a political movement from the get-go, and then every investigation that was undertaken confirmed that it didn’t happen. So they created this expectation that the cop was going down. They created the expectation that cold-blooded murder had taken place, and then they do their exhaustive investigation and they find out not only was there no cold-blooded murder, but that Officer Wilson may have in fact used a little bit more restraint than he should have. He was entirely justified. So now they’re stuck. They have created all these expectations. They have essentially promised the community that they’re gonna get justice for this. And now what do they do? So they have to issue a report that exonerates the cop and they do it in 82 detailed, chock-filled pages leaving no doubt. That’s not good. That doesn’t give the community what the community has been expected and what they’ve been led to expect. So they tack on to the, “By the way, this is a racist, sexist department,” and the crowd got its energy from that. They had to get something. They were promised, and the investigation did not deliver the goods, so they had to do it another way, and that was, “Okay, this cop, this particular cop, this particular incident, nothing to see here. He was entirely within his bounds. There was no ‘hands up, don’t shoot.’ But take Wilson out of this department, this is a racist, biased, prejudiced department.” What do you expect is going to happen? And it did.